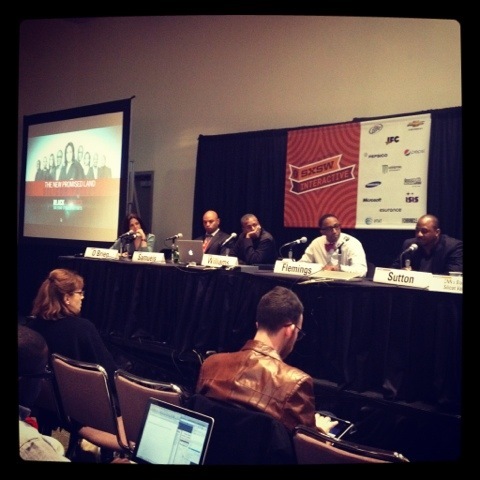 There is no shortage of conversations surrounding Blacks In Tech at SXSW 2012. Day one kicked off with the panel Blacks in Silicone Valley: The Aftermath. Over the course of nine weeks, O’Brien followed a technology-focused accelerator program designed to help eight African-American digital entrepreneurs, who share a three-bedroom house in Mountain View, Calif., in an effort to secure funding to establish their businesses. At SXSW, O’Brien brought together a handful of those digital entrepreneurs to talk about the aftermath of the show. The biggest takeaway? While Blacks in tech have come a long way, there is still a long way to go! How do we get past the diversity bias? We have to work together and become leaders. It’s still too early to tell but early results are in and Ophrah has yet another hit on her hands with OWN. Did we every really doubt her… come on… did we… really? 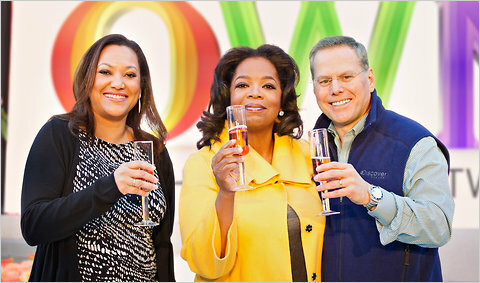 OWN: Oprah Winfrey Network About 770,000 people tuned in on New Year’s Day for the inaugural hour of OWN. Above, Oprah Winfrey with Christina Norman, C.E.O. of OWN, and David Zaslav, president and C.E.O of Discovery Communications. Discovery Communications expects Oprah Winfrey’s cable channel to achieve profitability in its first year. Discovery and Ms. Winfrey flipped the switch on OWN, short for the Oprah Winfrey Network, on New Year’s Day. The new channel enjoyed heavy sampling among viewers over the weekend, though executives have cautioned that they expect a bumpy ratings ride in the beginning. Ebitda is shorthand for earnings before interest, taxes, depreciation and amortization, and is a standard measure of operating profitability. 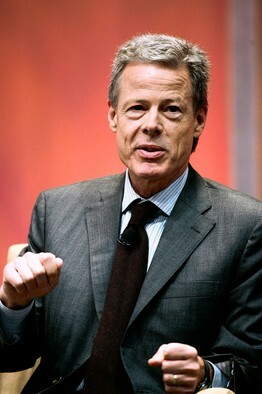 Discovery had previously told analysts and reporters not to expect the joint venture to turn a profit before 2012 or 2013. Nielsen data showed that about 770,000 people tuned in for the first hour of OWN on New Year’s Day, and almost 1.2 million watched two prime-time episodes of “Season 25: Oprah Behind the Scenes,” a reality show about the last season of her talk show. Programs that did not feature Ms. Winfrey did not fare quite as well, but OWN said that “Ask Oprah’s All Stars,” a special featuring Dr. Phil McGraw and others, attracted 968,000 viewers on Sunday night. NEW YORK (Reuters) – Walt Disney Co (DIS.N) and Google Inc (GOOG.O) are in talks that would allow ABC’s online shows to be viewed on Google TV, but the two remain far apart on piracy concerns, Disney’s TV chief Anne Sweeney told Reuters. “It’s fair to say there’s conversation with Google,” Sweeney told Reuters and the Reuters Media Summit. Google TV is a Web television service that lets viewers find Web content on television screens. Last month, three networks, including CBS (CBS.N), Disney’s ABC and General Electric Co’s (GE.N) NBC blocked their programing from Google TV, which puts the Web on people’s television sets. Sweeney said the talks have been mostly focused on Disney’s concerns about piracy issues. Disney’s concern is that Google TV doesn’t completely block out all pirated content. There is a work around… “you bring up the browser menu, then go to “more”, and then “settings”. From there go to “advanced” (as seen above) and then “mode”, and finally change the user agent mode from “default” to “generic. There you have it, you may now go back to watching all of your favorite Fox shows on Google TV… that is until Fox plugs this workaround like Hulu did. Stay tuned”. 11.11 – Update: User agent fix unblocks Fox.com…for now. Another one bites the dust. 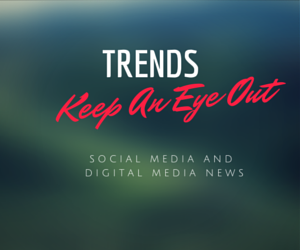 A couple of weeks ago, Fox.com was atop our list of Websites that could still be accessed on Google TV to stream full episodes of content. Well, you can go ahead and cross Fox off that list, as they are now blocking Google TV devices (see the photo above). The list of networks allowing Google TV devices to access their online content appears to be dwindling. Stay tuned. Not to be outdone by Apple TV, Google TV just rolled out thier new offering. It’s enough to make your head spin! I have no idea what to ask Santa for now!